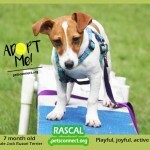 Rascal is an upbeat, lively, inquisitive, and friendly young pup. He is a Jack Russell Terrier pup and true to his breed his very active! 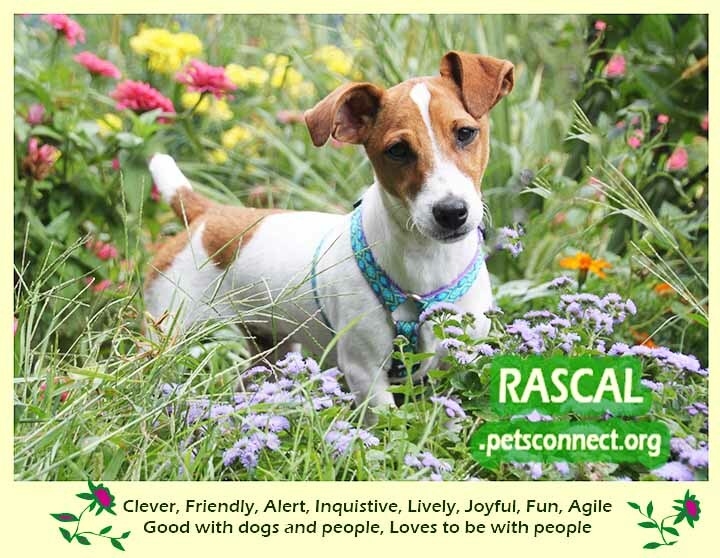 He is agile and fun loving and joyful too. 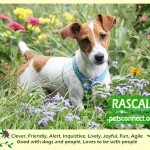 Rascal loves being with people and does fuss when left in his crate. He calms down but just so his future adopters know that he does pull out the cards to get you to let him out. Rascal loves the biggest bones in the house. It’s hilarious to watch him walk around with a bone that sticks out of his mouth a good four inches on each side! He is so proud when he snags one of these. 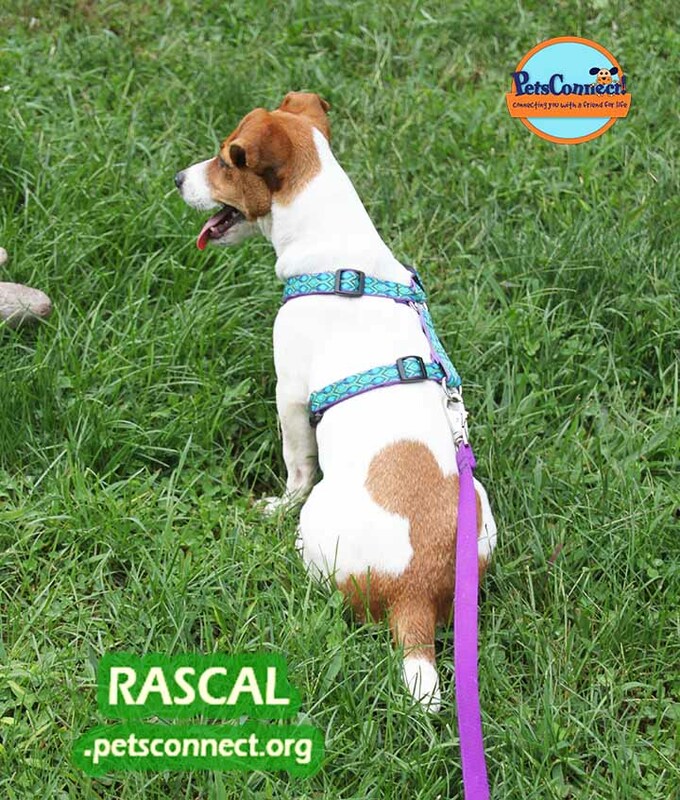 The Jack Russell Terrier, also called the Parson Russell Terrier, is a favorite among horse owners, dog sports enthusiasts, animal trainers for film and television, and people who simply appreciate his fearless personality, boundless energy, entertaining antics, and portable size. But beware! 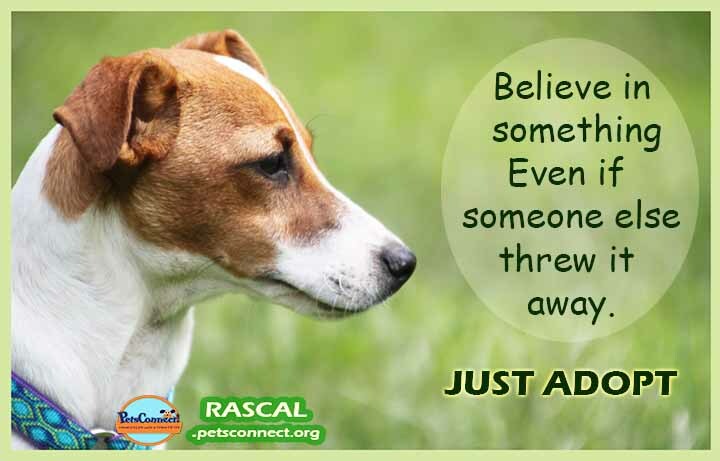 The trained Jack Russell that you see on TV or in movies doesn’t come that way. 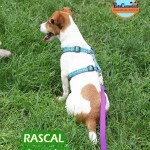 Teaching a Jack Russell to become a civilized companion is no easy task. It requires lots of time and patience as well as a strong sense of humor. 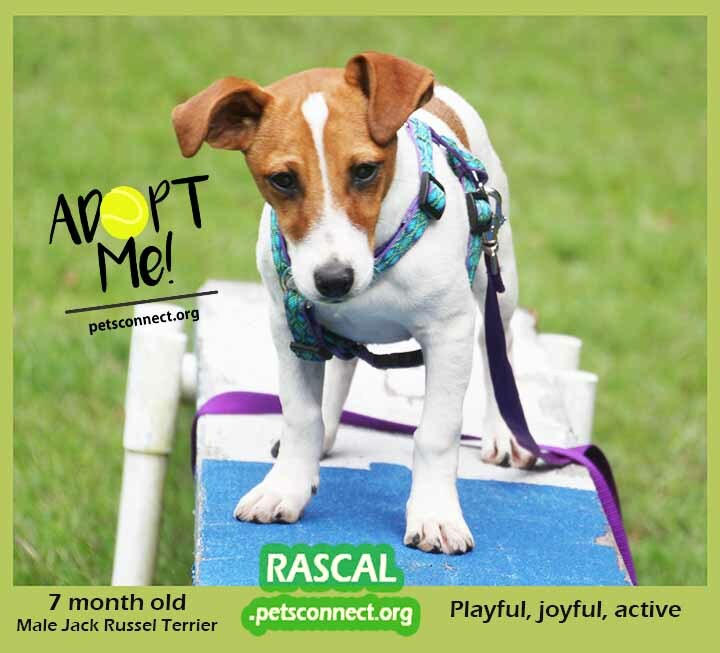 The JRT is highly trainable, but he has a mind of his own and won’t stand for boredom. If you don’t keep him entertained, he’ll find his own amusements, and you probably won’t be happy with the results. 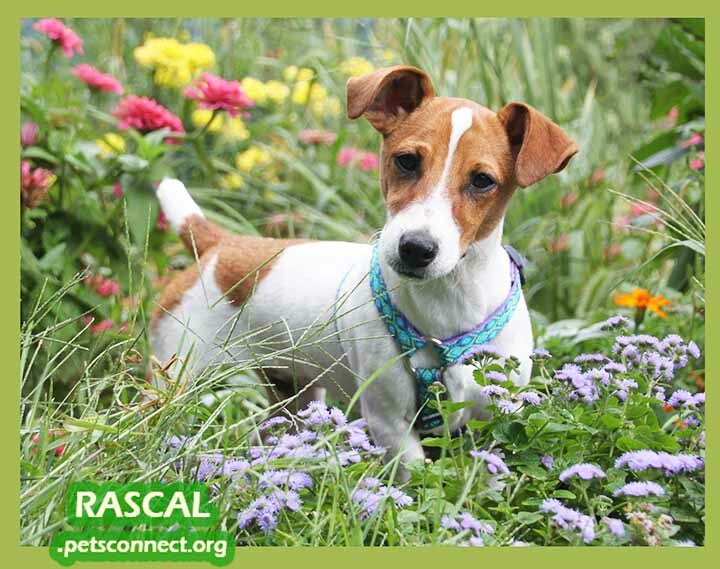 If you want a dog who can learn tricks, run an agility or flyball course in seconds flat, play fetch until you drop, and who will make a charming companion when he’s not getting into mischief, the Jack Russell may be the dog for you. If you can’t deal with a dog who will chew, dig, and bark, rocket through the house multiple times daily, chase cats and other small animals with glee and murderous intent, and will always find the loophole in any command you give, he’s definitely not the dog for you, no matter how cute and small he is. 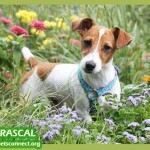 If you have the time and patience to devote to him, the Jack Russell has many qualities that make him an ideal family dog. He’s devoted to his people and loves being with them. His heritage as a hunting dog makes him an excellent jogging companion once he’s full grown. Active older children will find him to be a happy and affectionate playmate, but his rambunctious nature can overwhelm younger kids. On the downside, his fearless nature frequently puts him in harm’s way. He has tons of energy and won’t be satisfied by a sedate walk around the block. This is a dog who loves to run and jump and fetch. Plan on giving him 30 to 45 minutes daily of vigorous exercise. 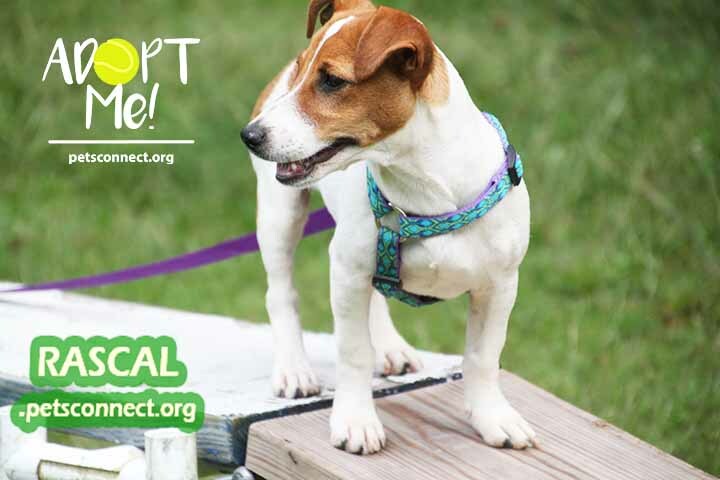 He’s an escape artist who’s best suited to a home with a yard and a secure fence that can’t be climbed, dug under, or jumped over. 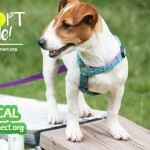 An underground electronic fence won’t contain a JRT. The Jack’s strong prey drive makes him entirely untrustworthy off leash, so you’ll need snap on the leash when you’re outside of fenced areas. And his instinct to “go to ground” — to dig for prey — means your garden isn’t safe from excavation.